The cheery bird-and-butterfly pattern is a pricey designer wallpaper, and looked super in this sun room off the living room of a 1940’s home near the Rice Village (Houston). But the thing is, the new homeowners are using this room as a home office for the husband. Needless to say, he was not thrilled with the frilly wallpaper! The couple was considering grasscloth, but I explained about the highly visible seams, the color differences between strips, potential for staining by young children with sticky hands and being ripped up by their dog. 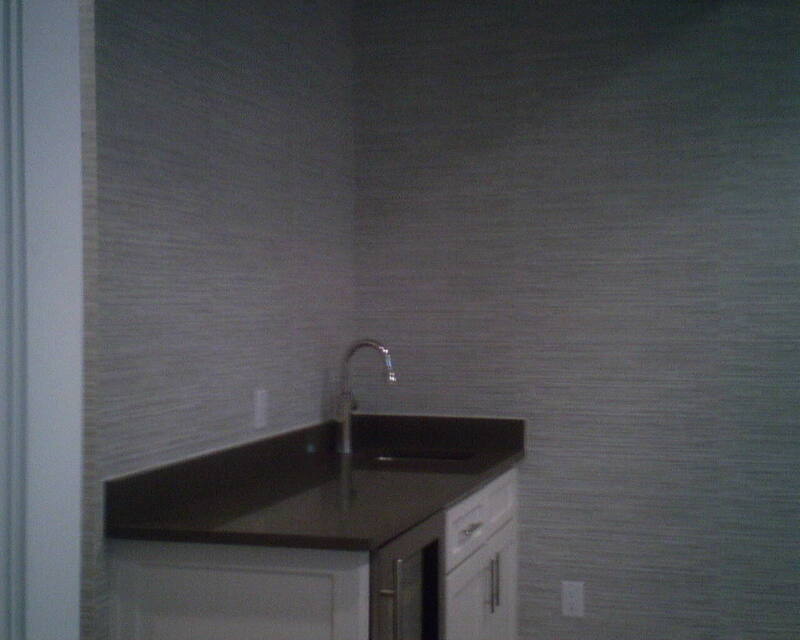 They took my suggestion and went with this faux grasscloth, with a woven texture and subtle two-toned color. The charcoal color looks sharp against the white woodwork and desk, and the feel is crisp and tailored – just perfect for a man’s space. 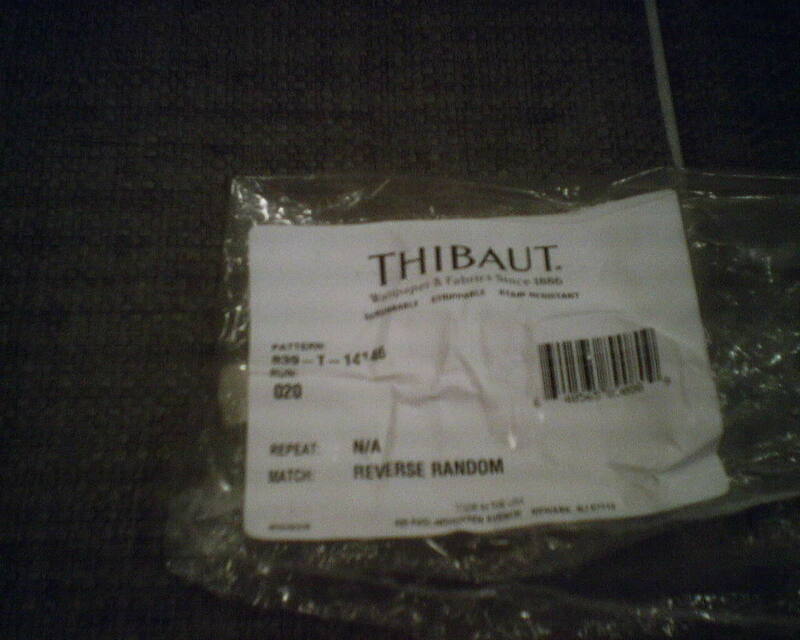 I love this particular product! Because it is a thick vinyl on a woven fabric (scrim) backing, it will wear like steel, and will be resistant to water and stains, too. 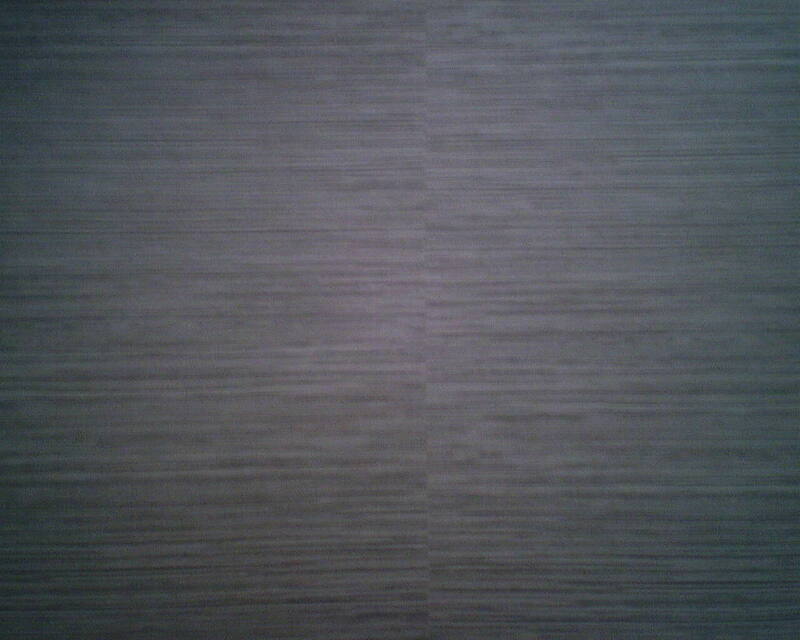 The color is very uniform, and you cannot see a seam. It’s nice to work with, too – although the thickness makes it a little difficult to cut through when trimming at ceiling and floor and door moldings. This wallpaper pattern is by Thibaut Designs, from their Texture Resource Volume 4 book, and has become so popular that it is available in about 30 colors! This one is called Bankun Raffia, #839 T-14146. It was bought at a discounted price from Dorota Hartwig at Southwestern Paint on Bissonnet near Kirby. (713) 520-6262 or dorotasouthwestern@hotmail.com. She is great at helping you find just the perfect paper! Discuss your project and make an appointment before heading over to see her. If you’ve spent any time on my blog, you know that I am not a fan of grasscloth. I don’t like that you can see all the seams, there are too may issues with color differences between strips (paneling) and even within the same strip (shading), plus it stains easily, and dogs and cats love to tear it up. There are faux grass products out there, and you can read about some of my favorites by doing a Search on this blog. However, today I hung a new product, and it was fantastic! 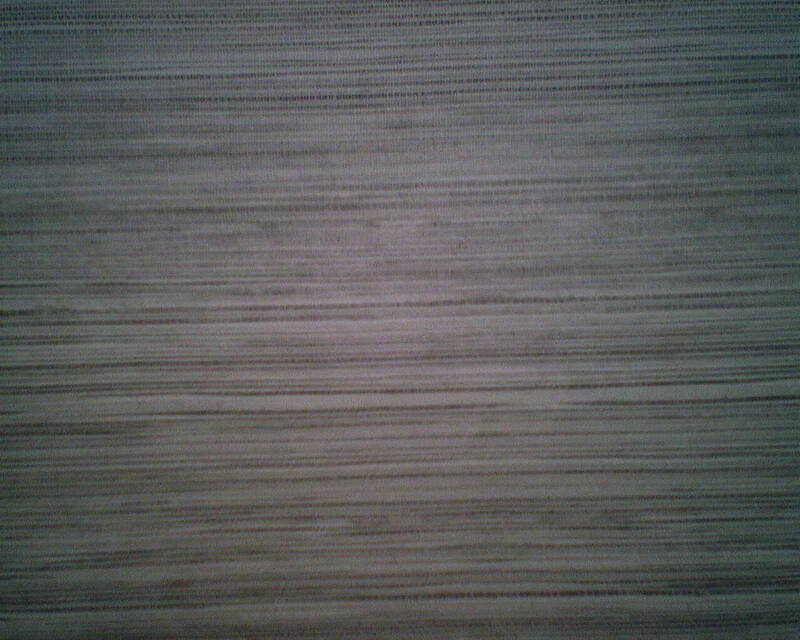 I think the surface is vinyl (at least it smelled like vinyl), and has a realistic print that mimics grasscloth. Then the manufacturer attached string to the material, as would be used to attach grass reeds onto real grasscloth wallpaper. This creates the texture that has such appeal to people, and bolsters the realistic look. Even better, this product has a pattern repeat, so, unlike real grasscloth, the strands of “grass” can be matched from strip to strip, so you will never see a seam. After this paper was purchased to cover one accent wall in a TV room, the homeowner decided to add a couple of walls (three, to be exact), so I had to pull out my “paper stretcher” and make one wall’s worth of paper cover four. I spent about an hour measuring and plotting and remeasuring, but managed to squeak by – with only one piece left, that was only 28″ long. !! If I had matched the pattern, it would have used up a lot more paper, and we would have run short. 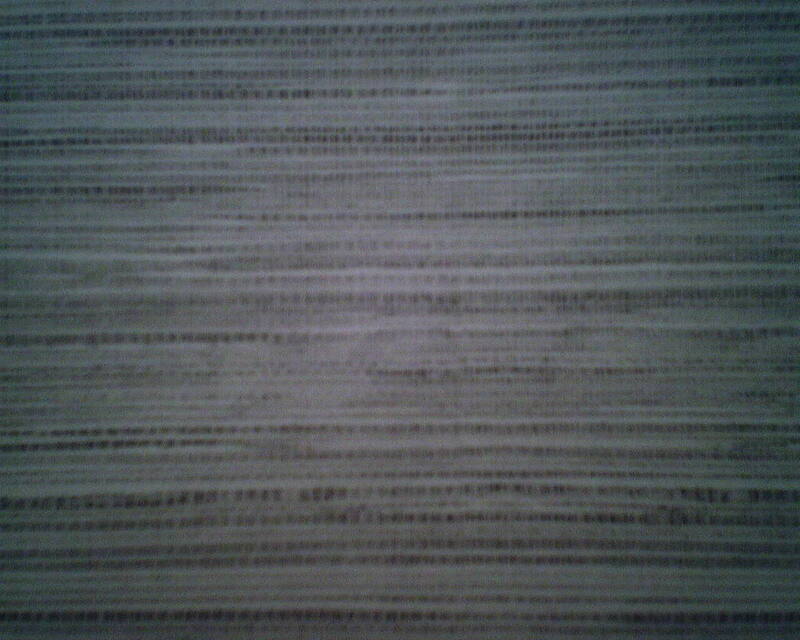 So I hung the paper as if it were real grasscloth, where the seams do not match. 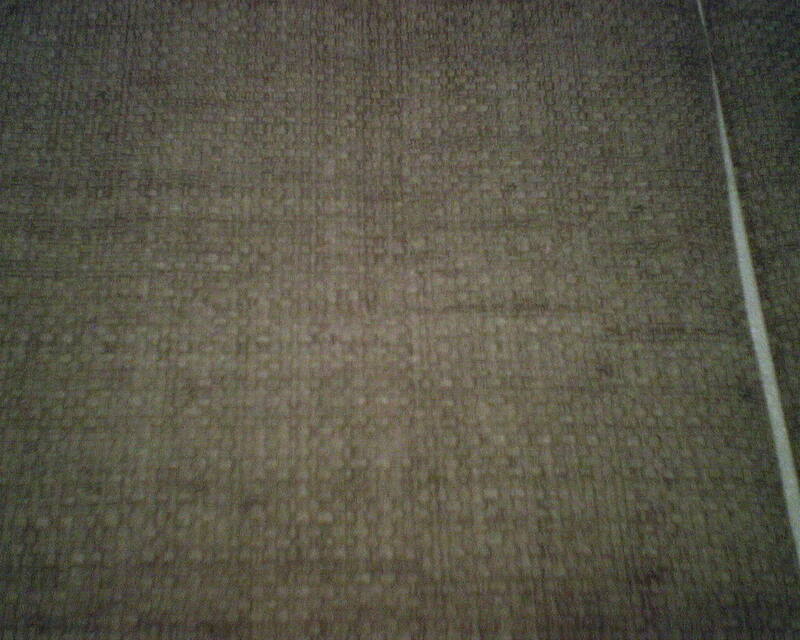 Because the product is so uniform in color and pattern, the unmatched seams look far better than real grasscloth. On the final wall, which needed only two strips, I was able to match the pattern, and this is what you see in the last photo. Meaning, you absolutely cannot see the seam. The paper was very nice to work with, too. It trimmed easily and didn’t gobble up my razor blades or damage my scissors like coarse grasscloth will do. There were no strings hanging in mid-air, and the material was nice and malleable and allowed me to position it as I wanted. Because it appears to be vinyl, and because I think the strings are treated with a sealer, I believe this product is somewhat stain resistant and washable – which real grasscloth definitely is not. 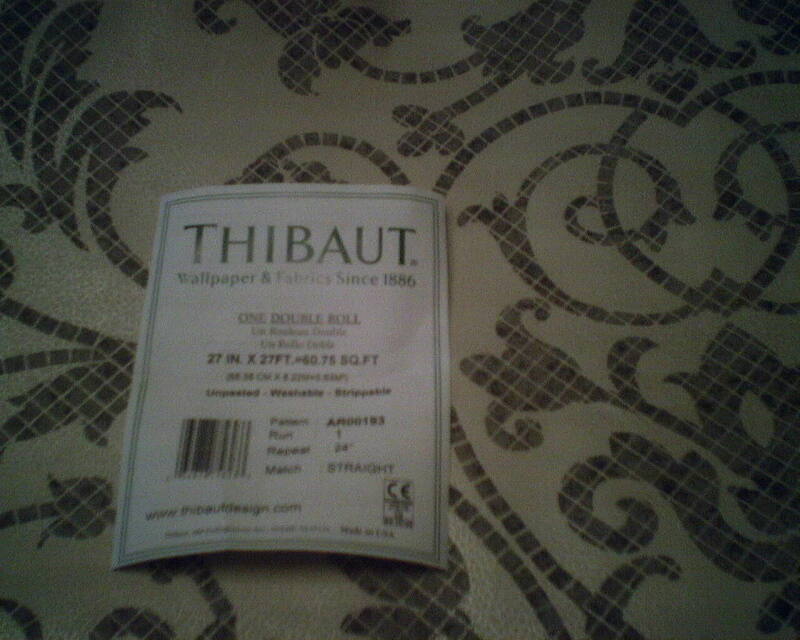 I am really happy to have discovered the paper, and I hope to recommend it to clients who are interested in grasscloth. It is in a book called “Grass Effects,” and comes in many colors and different textures, and even has some options that feature a Moroccan trellis on top of the textured paper. 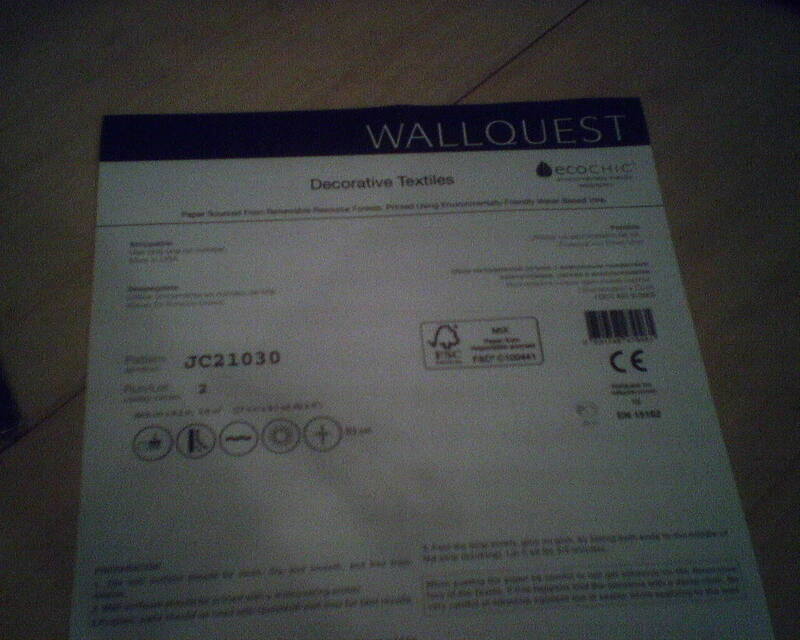 This wallpaper pattern is by Wallquest, in their EcoChic line, and was bought at a discounted price from Dorota Hartwig at Southwestern Paint on Bissonnet near Kirby. (713) 520-6262 or dorotasouthwestern@hotmail.com. She is great at helping you find just the perfect paper! Discuss your project and make an appointment before heading over to see her. Here is a fun “balls dropping” pattern in subdued greys and tans, with tiny glittery glass beads imbedded in the circles. This went on one wall in powder room – behind the sink and toilet – in a brand new, very contemporary home near Buffalo Speedway and Braeswood (Houston). The homeowner had the contractor remove the sink and toilet, so it was much easier for me to get the paper neatly behind those fixtures, and no cut edges along the top of the sink to worry about curling. The shot of the sink plumbing isn’t glamorous, but it shows how I plotted the layout so that the darker circle would be centered over the sink. The colors and theme go very nicely with the sleek, modern style of the home, and are a perfect match for the marble tile in the adjoining room. With lighting coming from the right angle, the glass beads will really sparkle! 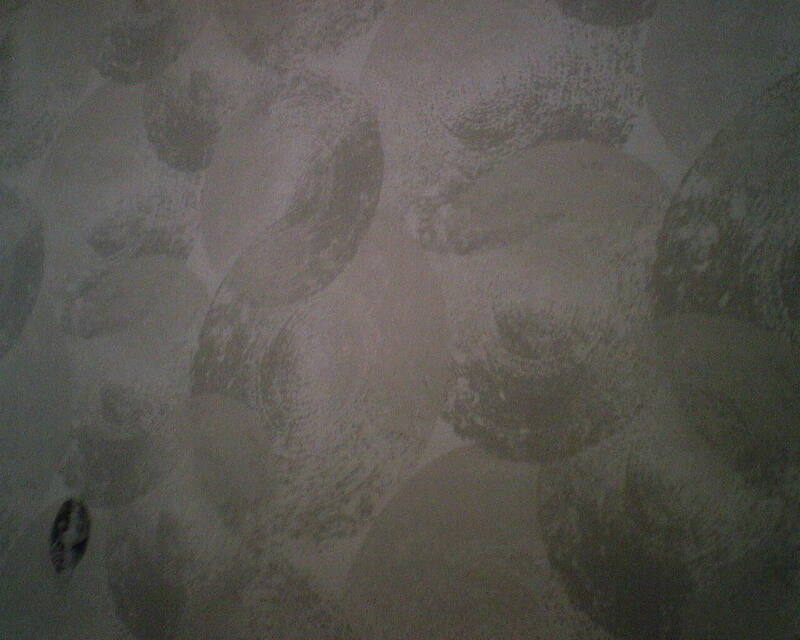 This wallpaper is by Anthology (by Harlequin), and is called “Eclipse.” It was on a non-woven substrate. Those glass beads love to fall off (the floor was covered with them), and it’s important to keep them out of the paste and off the back of the paper, or they will show as tiny pimples under the paper. I find that it’s easiest to keep the beads away from the paste and backing if you apply paste to the wall, rather than to the back of the paper. 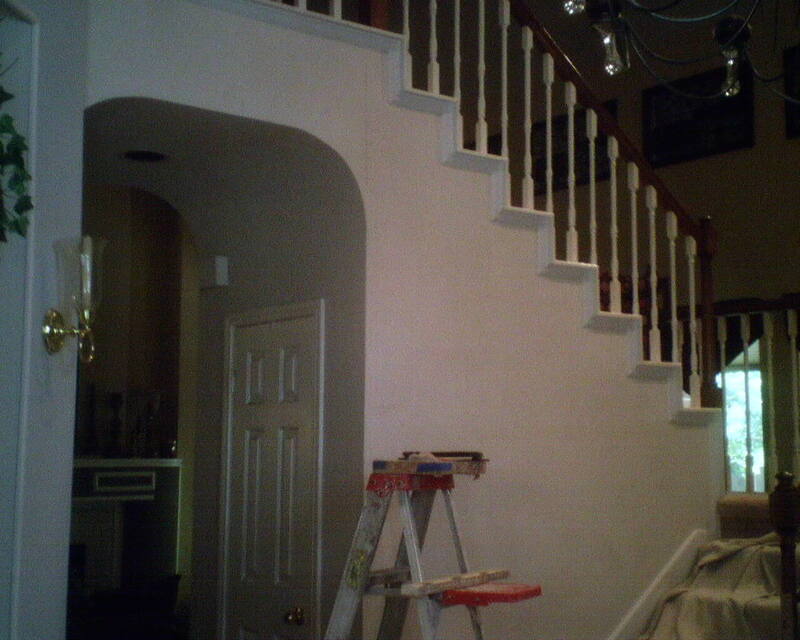 The walls were 12′ high, so I had to bring my 8′ step ladder to do this job. Voilà the transformation of a bland dining room into something sleek and hip. The homeowner said he was originally drawn to big prints and bold colors, but eventually settled on this quieter pattern. I think he made a wise choice. The “Geometric Tile” pattern compliments the contemporary feel of this newish home in the Montrose area of Houston, but doesn’t overwhelm the space. If the couple wants drama, they can add bold and colorful artwork, which will stand out against the neutral wall, but be easy to change if they get tired of it. 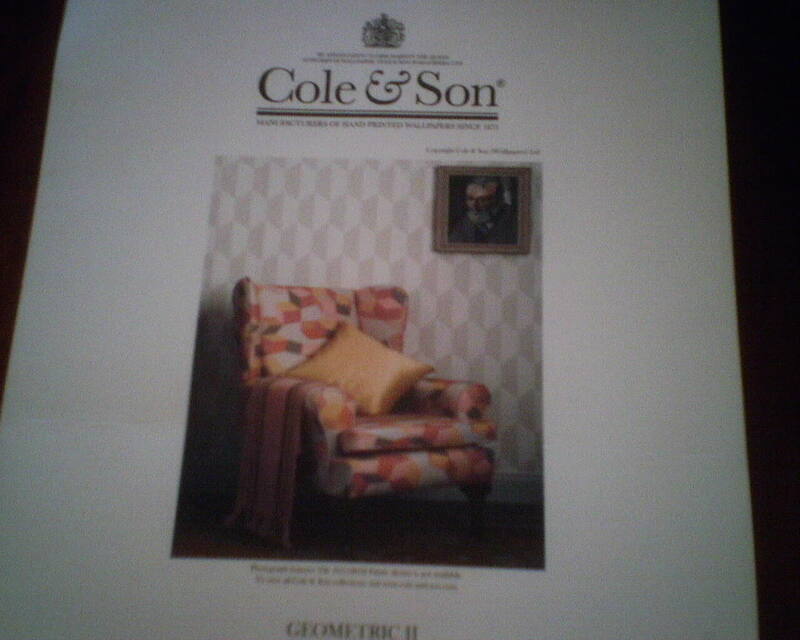 The wallpaper is by Cole & Son, a British company, is printed on a non-woven substrate, and is a paste-the-wall product. 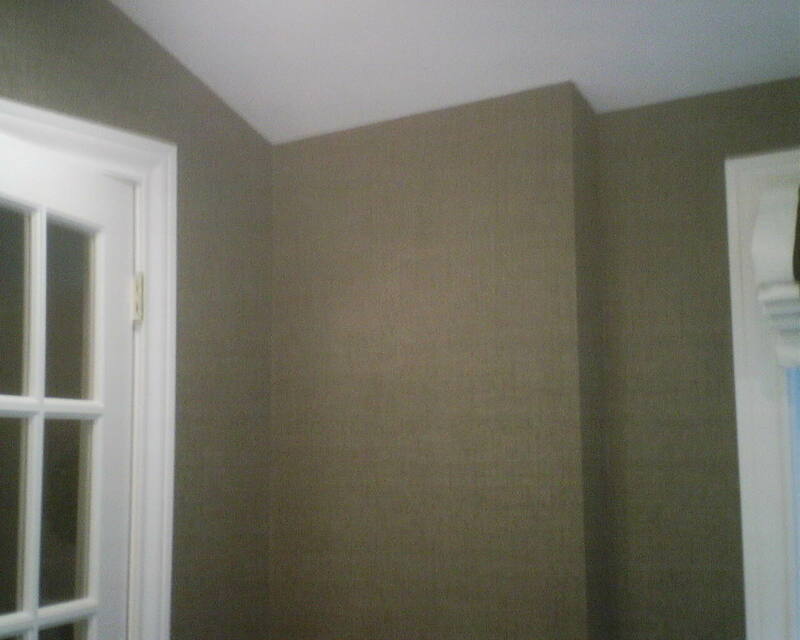 It is thick and spongy and stiff, and worked well enough on this accent wall, but would be more difficult in a room with more turns and intricate cuts. Stripping Wallpaper – Easy Peasy ! The wallpaper to be removed (the dark stripe) is a solid vinyl, prepasted material that was hung over newly smoothed walls. 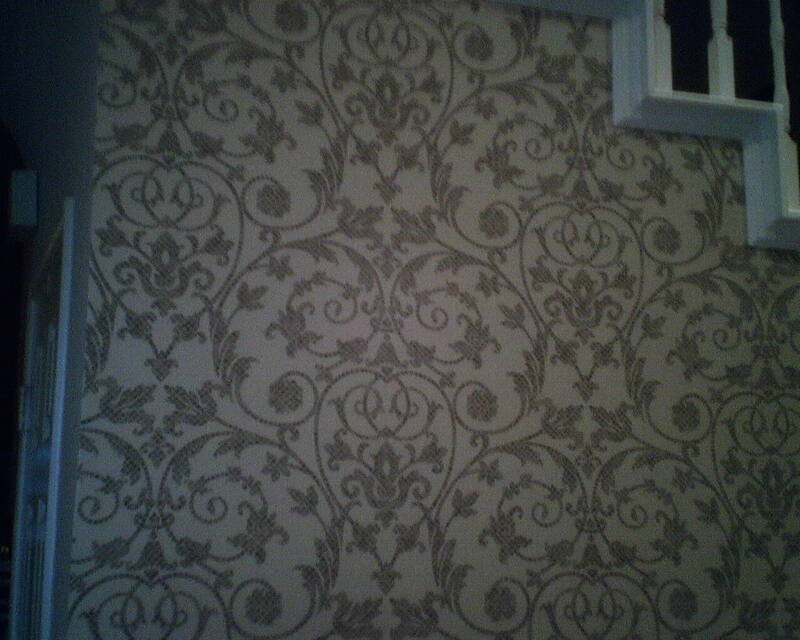 This kind of wallpaper usually strips off easily, and double so if the smoothing compound was not sealed or primed. Today went quickly. 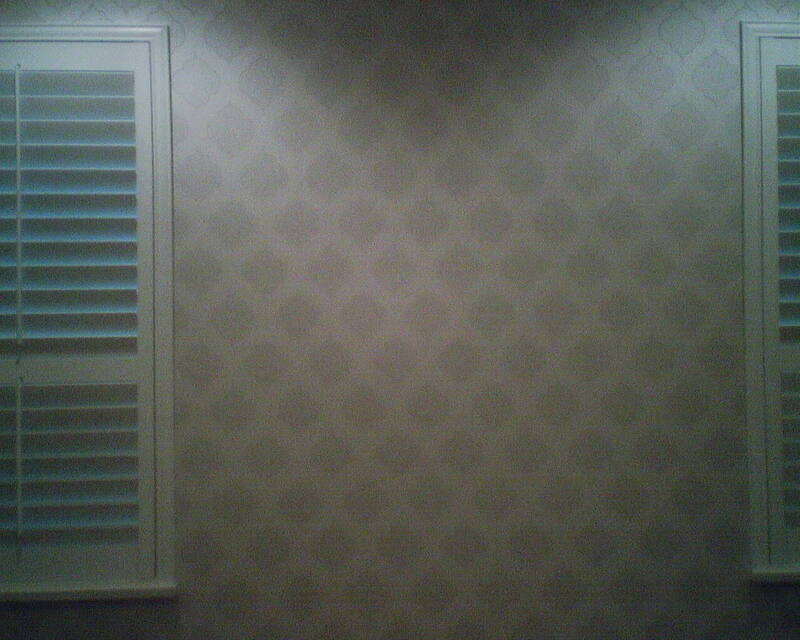 On the right you see the original vinyl wallpaper. In the middle is the paper backing that is left on the wall after the vinyl layer has been pulled off. And on the left you see where I have used a sponge to soak this backing with warm water. It doesn’t take long for the paste to reactivate and to release from the wall. 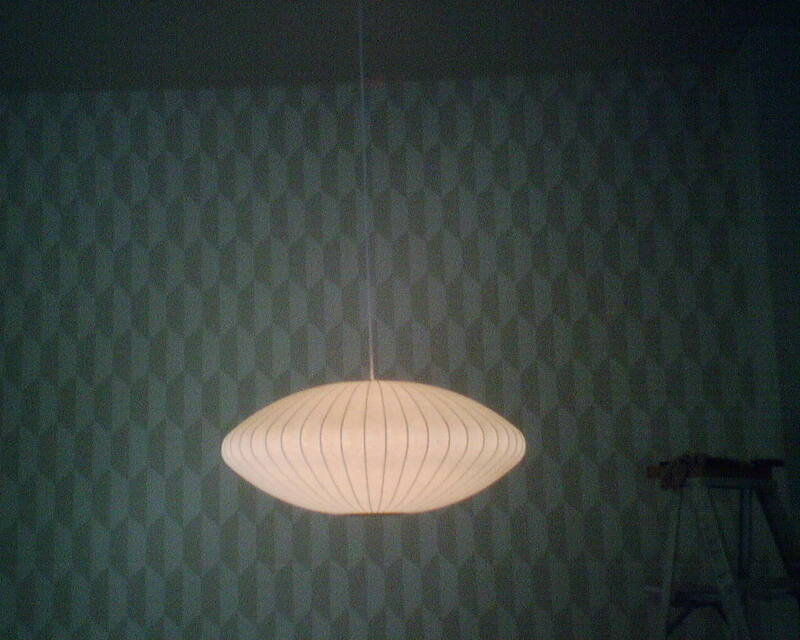 The last photo is of the wall clean of old paper, newly primed, and ready for the new wallpaper. The original dark striped wallpaper looked super in the entry of this Katy area (Houston) home when it was built (early ’90’s), but it was time for an update. 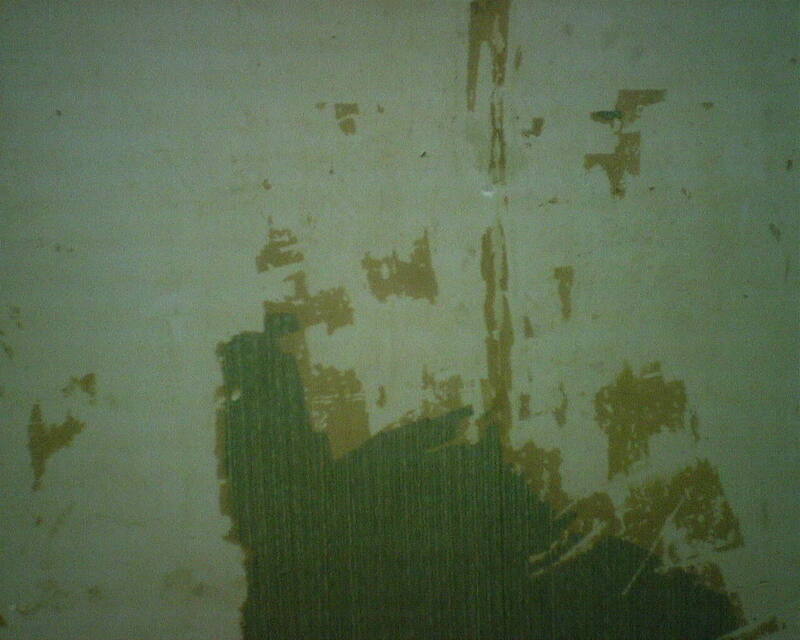 In the second photo, I am stripping off the old wallpaper, and you see several stages of that process. 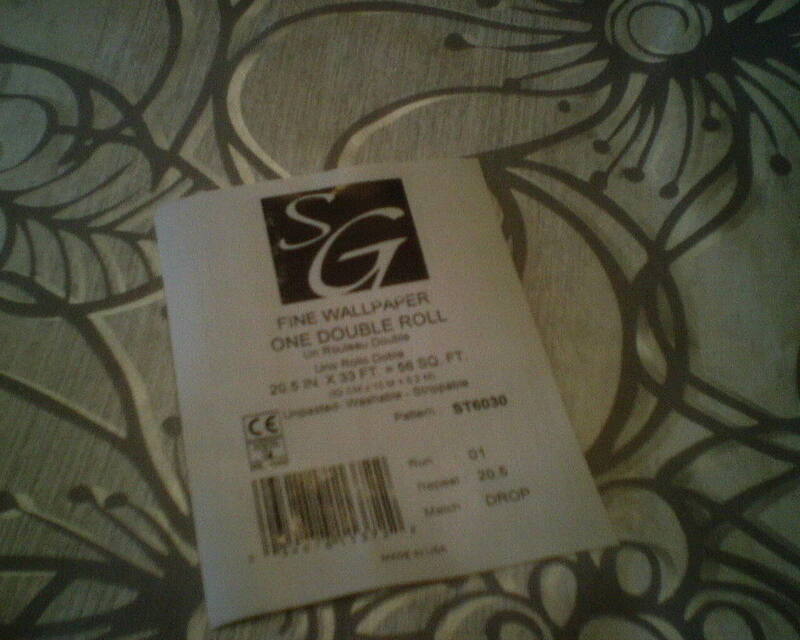 If you are intrigued, click the link on the right if this page (under “How To Strip Wallpaper) to learn how to do it yourself. 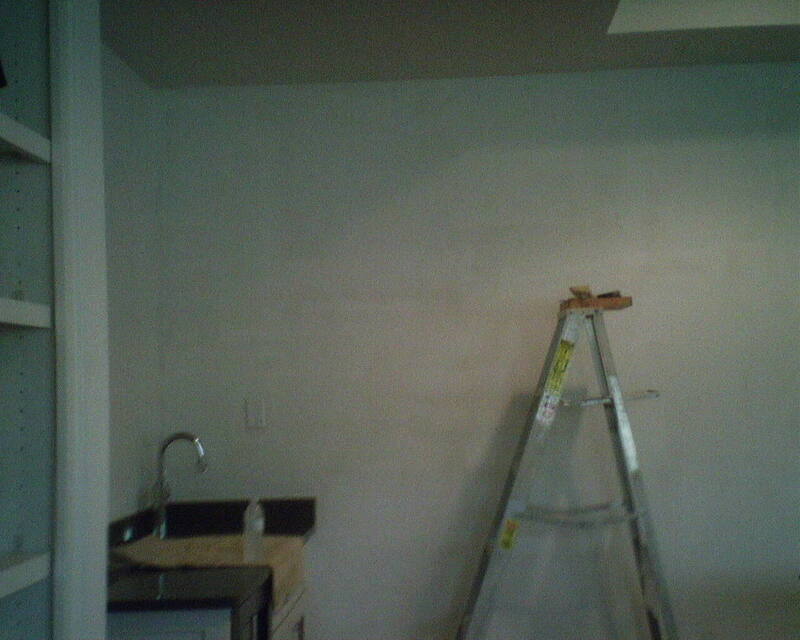 The third photo shows the wall prepped, primed, and ready to hang. 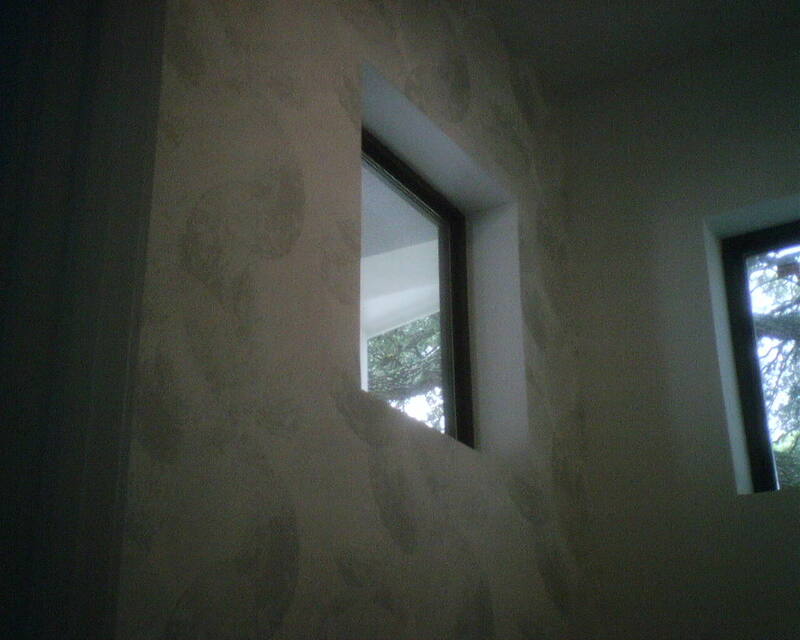 The next photos show the walls with the new wallpaper. 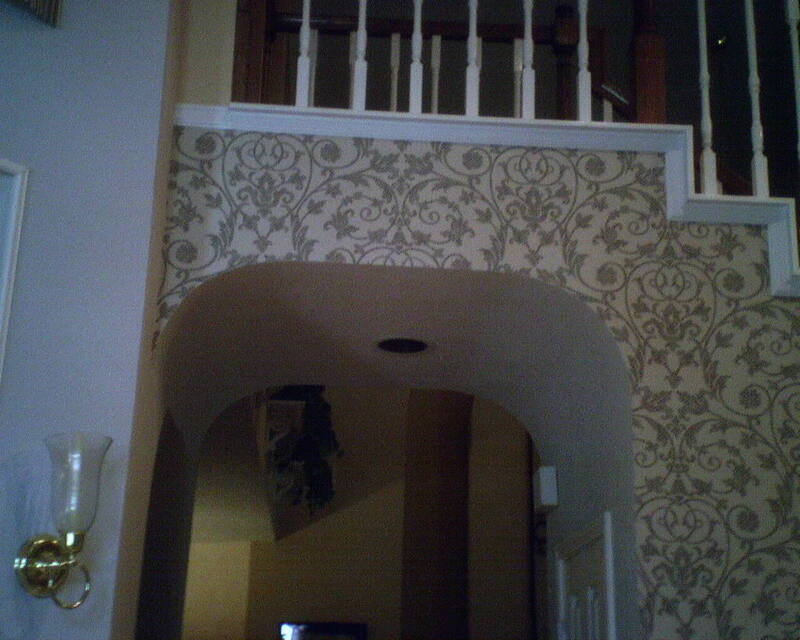 This wallpaper pattern is by Thibaut Designs, and was bought at a discounted price from Dorota Hartwig at Southwestern Paint on Bissonnet near Kirby. (713) 520-6262 or dorotasouthwestern@hotmail.com. She is great at helping you find just the perfect paper! Discuss your project and make an appointment before heading over to see her. The pattern is subtle and the color is subdued, and makes a great backdrop for this pre-teen girl’s bedroom accent wall. 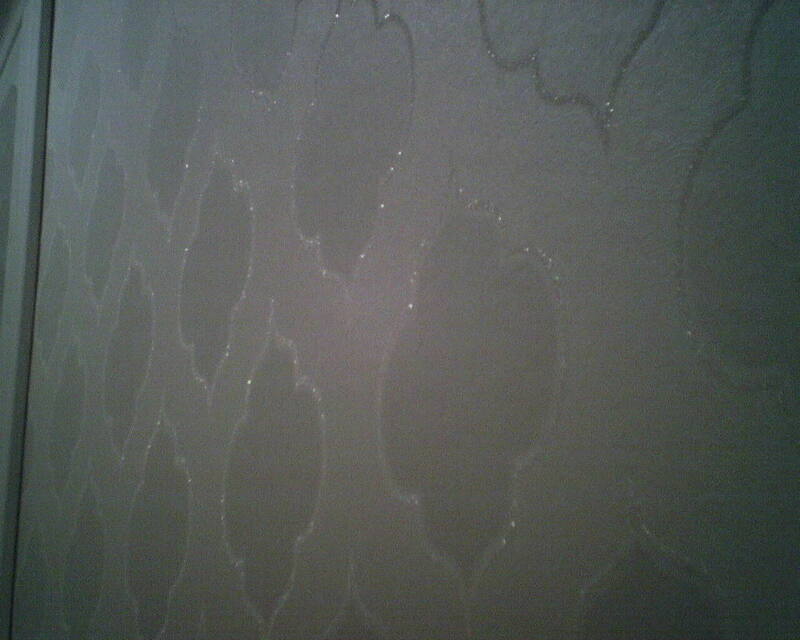 But look again in the right light, and you’ll see a lot of glitter and glimmer and shimmer in this wallpaper. Parts of the design are imbedded with glass beads, and they catch and reflect light, making the whole wall look rather exotic. Perfect for a gal this age! 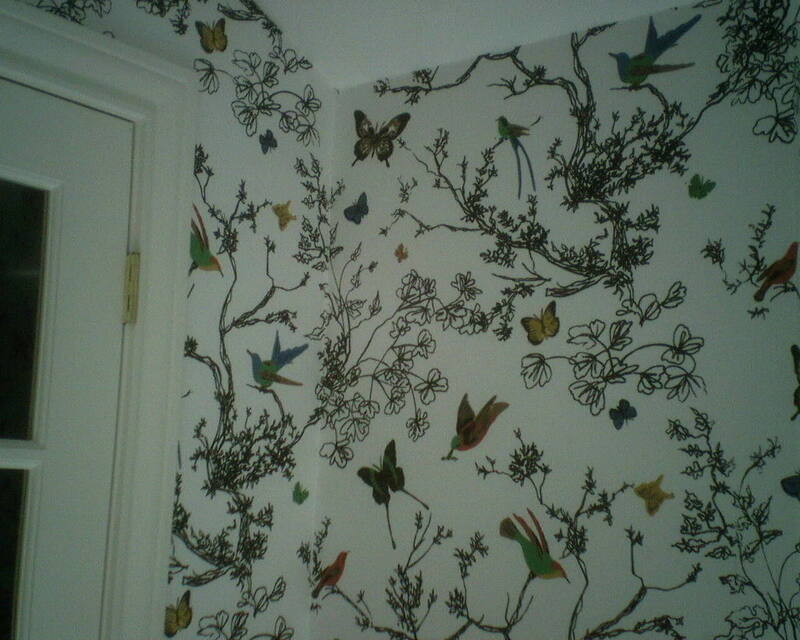 I hung this wallpaper in a new home in the Rice University area of Houston. The pattern is by Carl Robinson for Seabrook, and was purchased from Dorota Hartwig, (713) 520-6262 or dorotasouthwestern@hotmail.com. She is great at helping you find just the perfect paper! Discuss your project and make an appointment before heading over to see her. 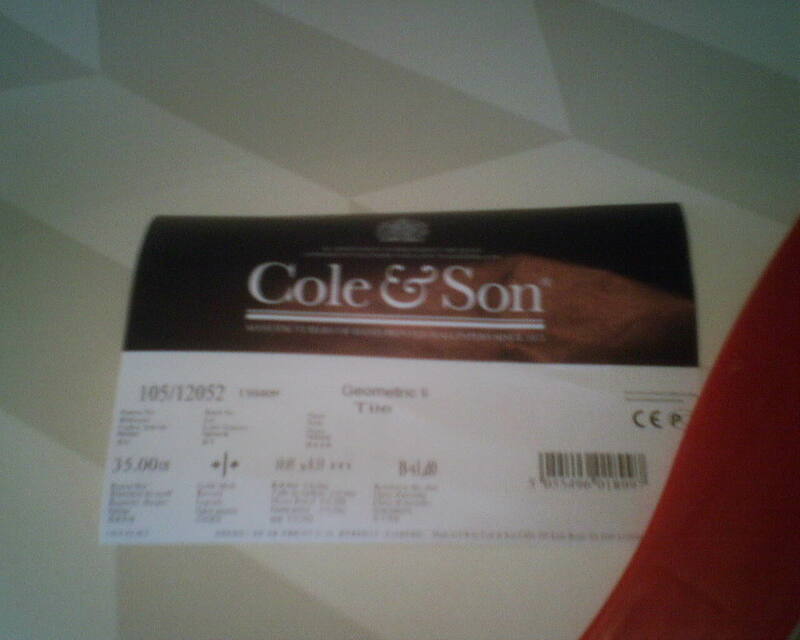 Monday: This evening, I got a call from a friend who is a member of the Masonic lodge not far from my house. It seems they are renovating a room – and hope to have it finished in time for an awards luncheon on Saturday. That would be four days from today. They intend to strip wallpaper, paint the walls and a heavily textured ceiling, pull up old carpet, and lay a new laminate floor. And it’s a BIG room. 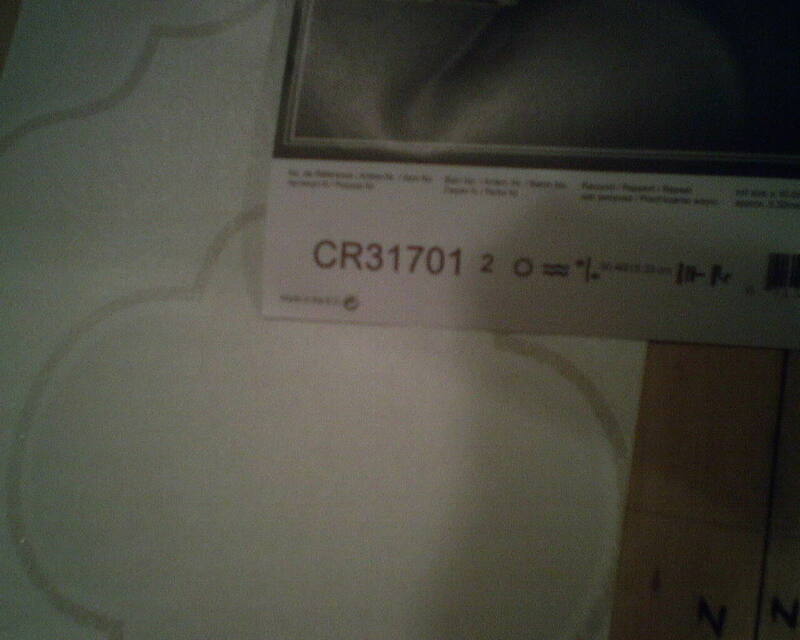 The top layer of wallpaper was vinyl, and stripped off easily and cleanly. But this bottom layer, which is the original paper from when the lodge was built in 1952, was not cooperating. They had soaked it, used a solvent, and tried scraping, but the paper wasn’t budging. That’s what you see in the photo – some original paper, some scraped off with backing and / or paste left on the wall, and some bare plaster. So my friend called and asked if I could take a look. I was curious, because this type of wallpaper usually comes off relatively easily, once it is soaked and the old paste reactivates. 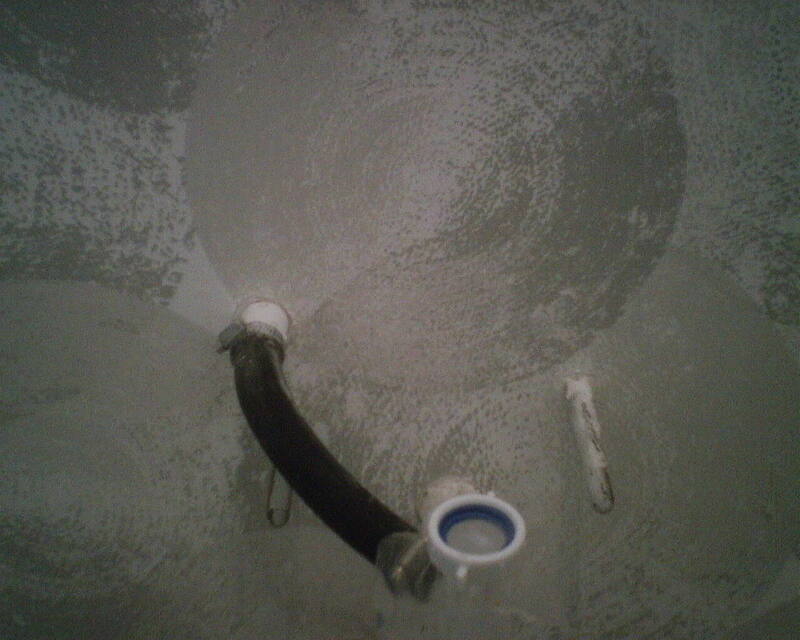 Especially since the walls appeared to have been properly sealed, which makes removal later easier. Sometimes, it’s time to call uncle. 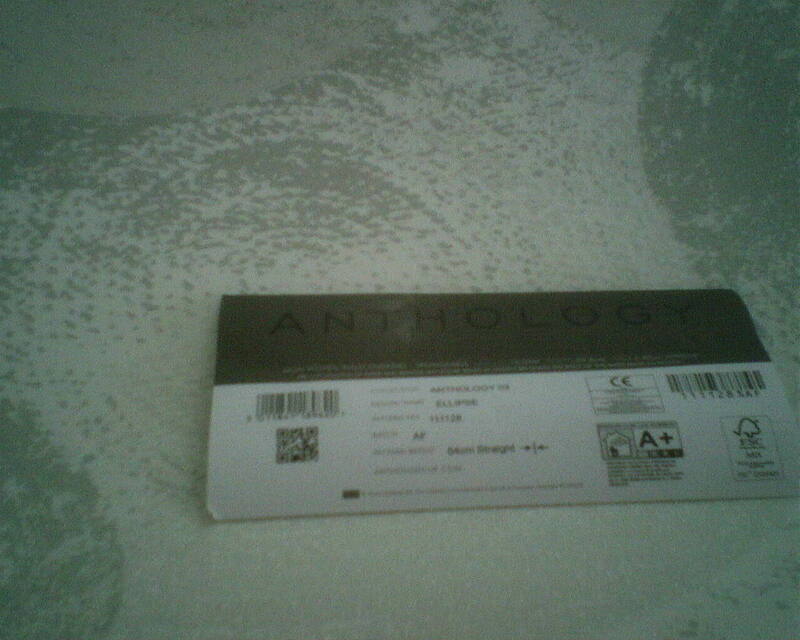 If the paper won’t come off, take proper steps to prepare it so you can go over it. So what they’re going to do is skim-float the wall with joint compound, which means they will be troweling on a thin layer of a plaster-like substance. Once that is dry (overnight), they will sand it smooth and then wipe off all dust with a damp sponge rinsed clean frequently. That will leave a very smooth surface, with none of the ridges from the torn wallpaper showing, nor any cracks in the plaster. 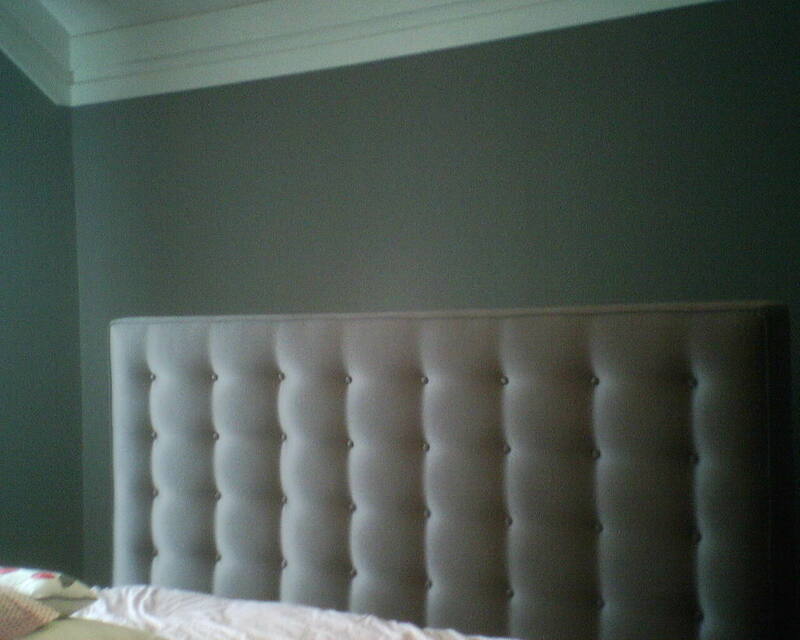 To create a uniform surface under their new paint, it is important that they float the entire wall, even areas that do not have torn wallpaper, because their new paint will soak differently into the various surfaces of the wall – plaster, wallpaper, wallpaper with a sealant over it, residue from wallpaper paste, etc. 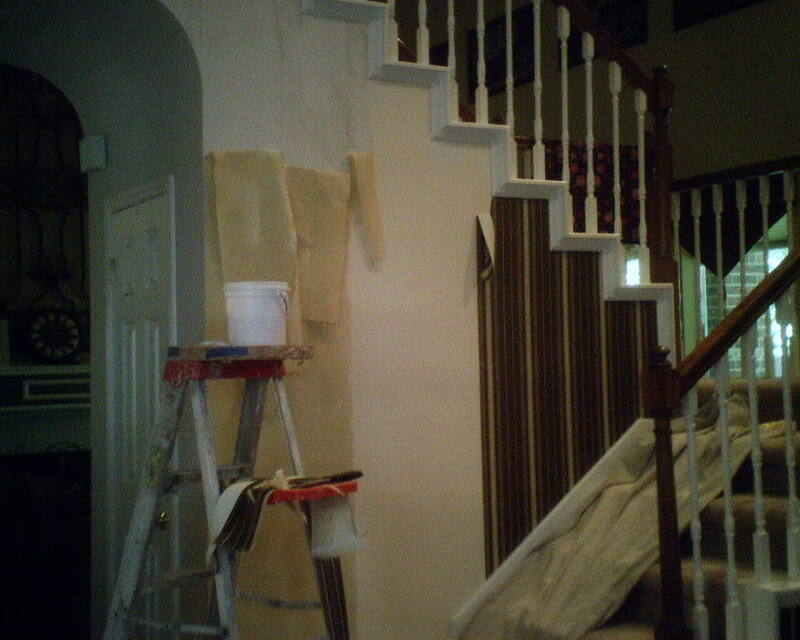 Skim-coating the entire wall, including corners and edges along ceiling and moldings, will create a perfectly uniform surface, that will yield a uniform finish on the new paint. I know you can hang wallpaper on top of Gardz, but they will have to ask the paint store guys if they can paint on top of it, or if it will need a paint primer first. It’s a lot of work, but the guy there whom I talked to seemed up for the challenge – he was knowledgeable, energetic and enthusiastic, and I got the impression that he didn’t have a day job and so could invest some serious hours at the lodge, getting the room into shape. They promised to give me an update, later in the week. 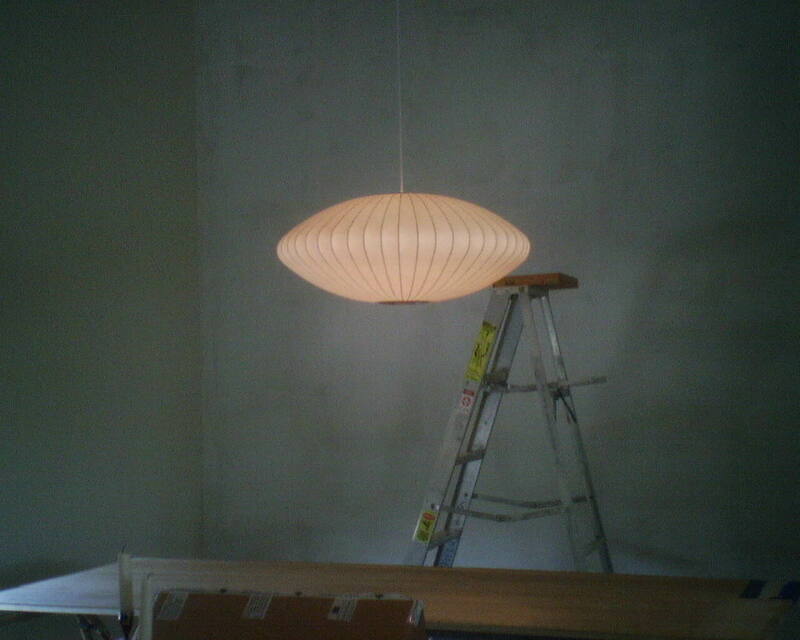 In this dining room, I hung the paper around the upper portion of wall first. Then I had two options for papering the column below. One was to line the balls up with the pattern above, so they fell in a perfectly plumb line. This would have moved the centers of the balls a little to the right of the center of the post. 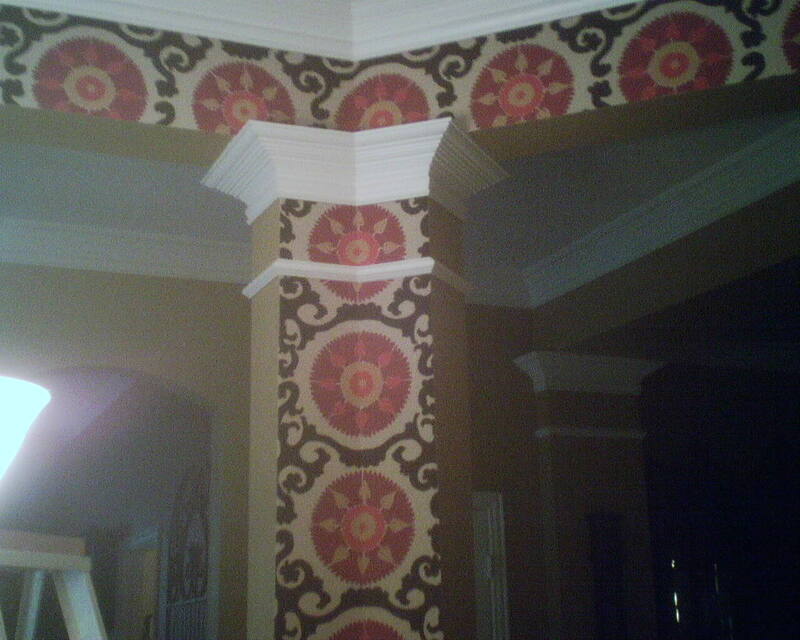 The other option was to make those dynamic circles really the focal point of the column, by giving them center stage. I placed them so their centers were smack in the middle of that central angle. This allowed the full ball to show, with none being cut off at either edge of the column. 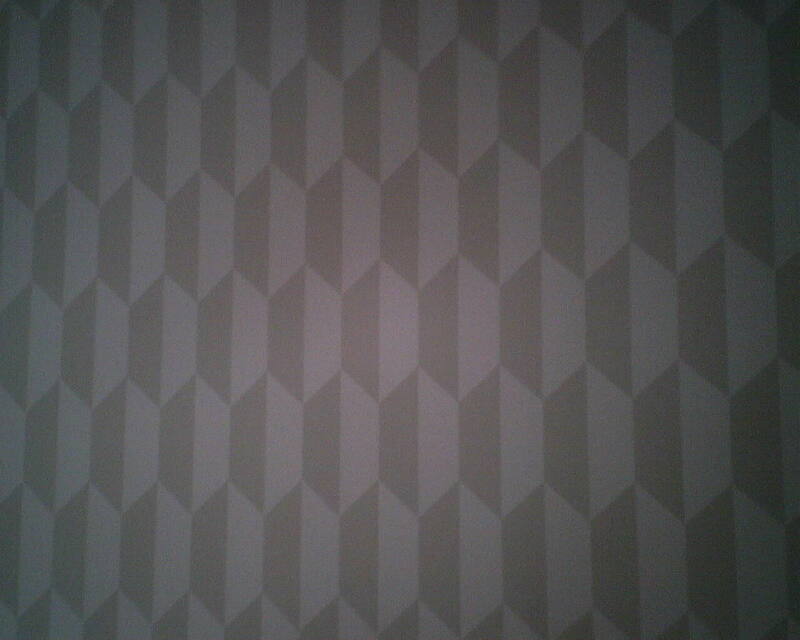 It’s a little out of alignment with the pattern above. 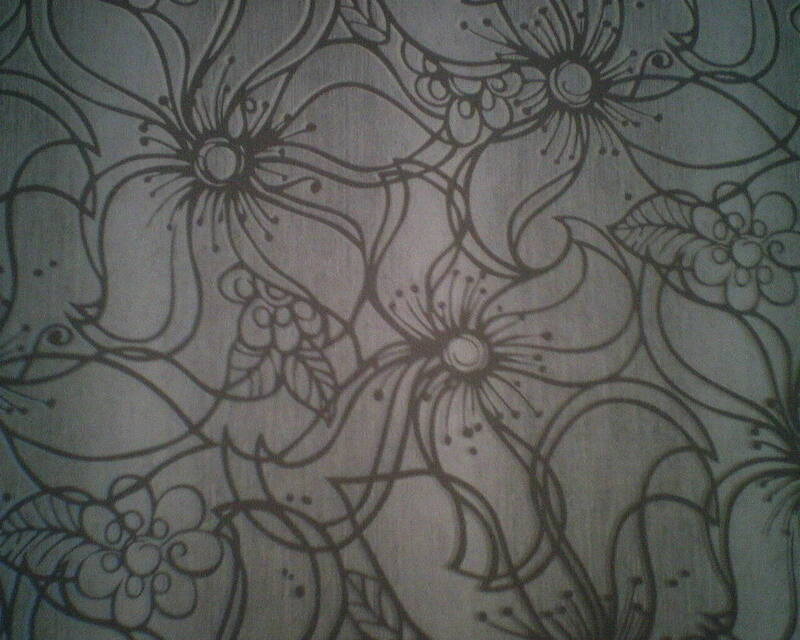 But this was a much better way to dramatize an already-bold pattern, and really draw the eye to it. 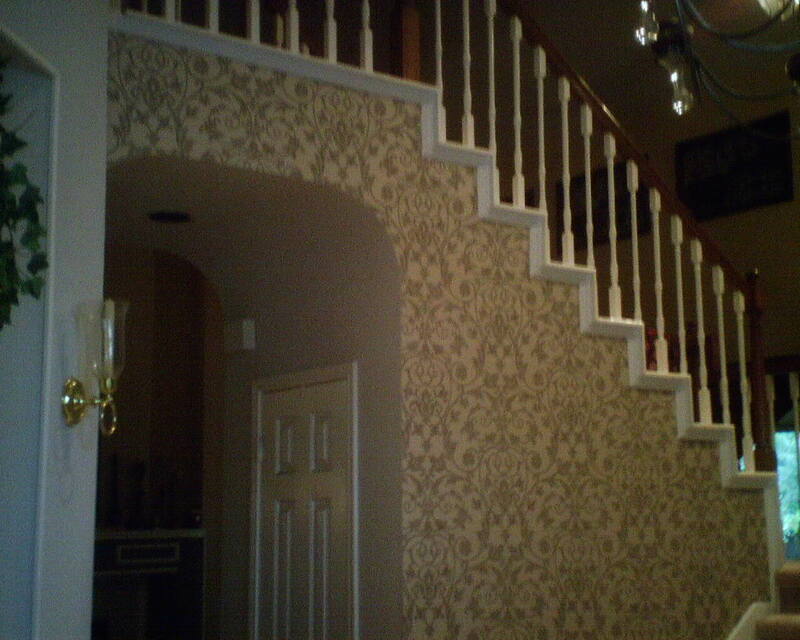 Hey, if you’re going to use a wild pattern like this, punch it up every way you can! 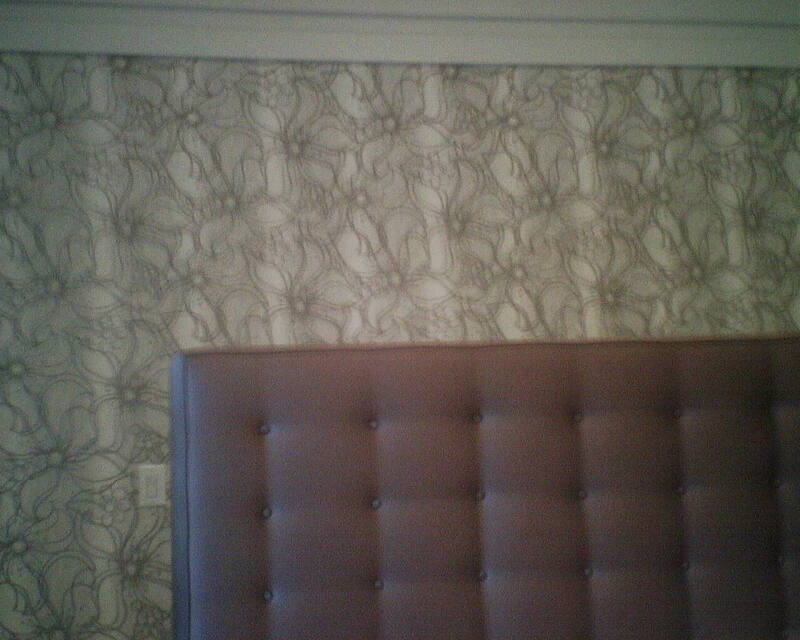 This wallpaper is by Fabricut, an comes with matching fabric. I hung it in a dining room in Greatwood (Sugarland) (Houston). You are currently browsing the Wallpaperlady's Blog blog archives for June, 2016.